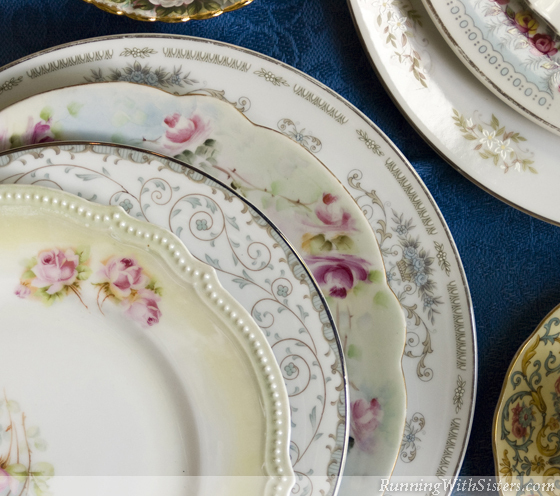 Give your traditional table a twist with mismatched vintage china. This year, we’re hosting the holiday festivities for the whole family. But with twenty-four on the guest list and only fourteen place settings between us, we thought we’d better get creative––and get to the flea market! 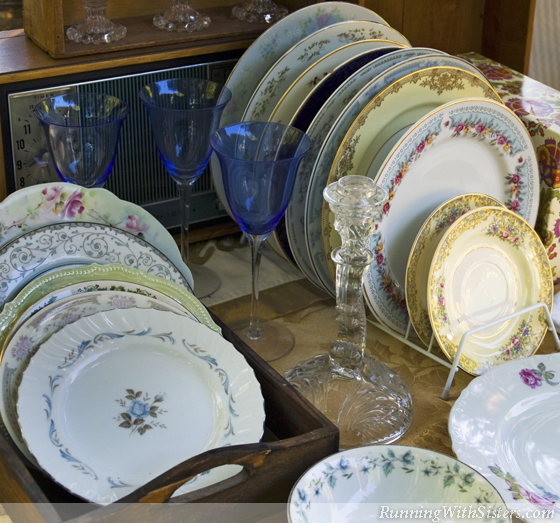 We decided to create a shabby chic look by co-mingling our own Wedgewood and Lenox with vintage pieces. 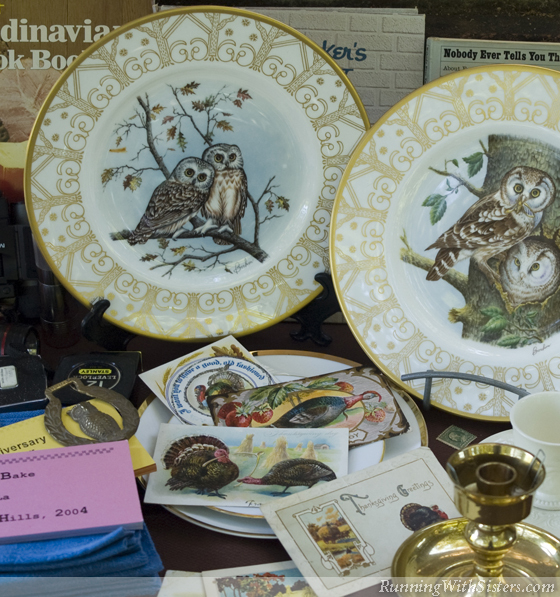 With each plate, cup, and spoon different from the next, the table will have a whimsical mood like the Queen went crazy at the flea market. Before we could pay our entrance fee, we spotted a booth with china plates displayed in dish racks. We headed straight there and chose five plates featuring fruits, flowers, and scrolls from the “Under $10” rack. Kitty gave the seller $25 for the stack. Off to a great start! Along the way, we couldn’t pass up a covered tureen with roped handles and a $12 chafing dish that just needed a good polish. 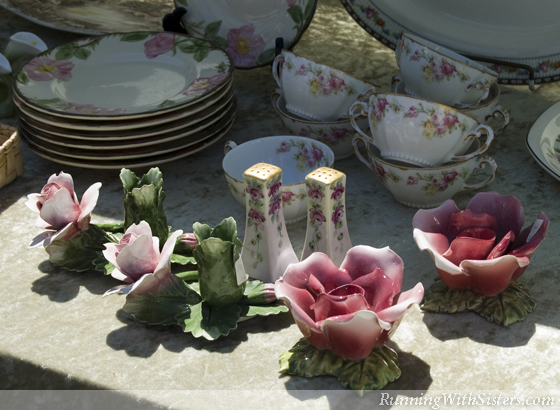 A pair of rose-shaped candleholders made it into our cart for only $8, and so did a footed butter dish and two gravy boats. (You can never have too many gravy boats!) Our friend Karen was making out like a bandit, too. She bought a crate of all-white china in a variety of patterns for only $35. And with that purchase, she started her collection of mismatched white china. Playful, but refined. To finish our list, we stopped by “the silver guy.” The last time we saw him, he sold us each a magnifying glass necklace for reading the tiny maker’s marks on the back of flatware. This time, he showed us some unusual serving utensils, like an asparagus fork, a toast server, and a marrow scoop (yuck!). 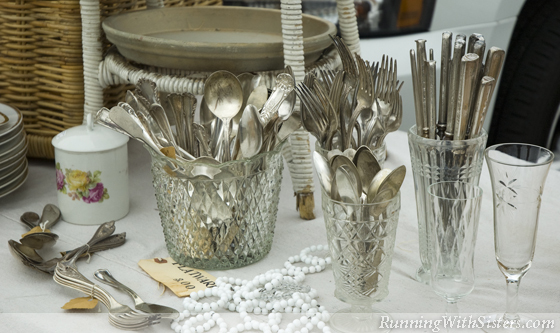 We passed on those, but Karen picked out a ladle with a monogrammed handle, while Jennifer sifted through a bin of silver-plated forks and spoons. We pooled our last few dollars, and he gave us a Turkey Day deal. To us, salt cellars are lovely little cups, perfect for holding a ring by the sink or a pair of earrings on the nightstand. But these Lilliputian bowls were originally used to serve salt at the dinner table until they were put out of business by modern saltshakers. These “open salts” are now highly collectible. We’ve seen them for $5 to $20 each at the flea market, but some sell for hundreds! 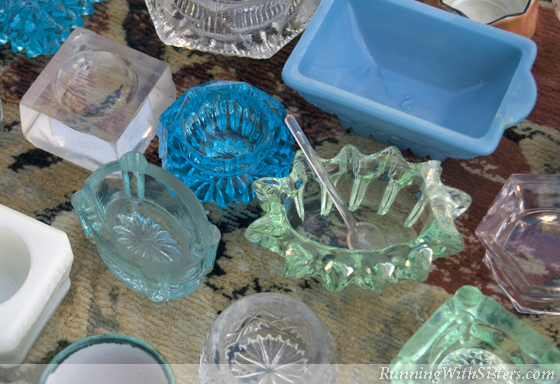 Our best tip about buying old china, crystal, and silver is to buy what you like. But if you’re paying a pretty penny, you might like to know you’re getting the real thing. Bone china is translucent, so hold it up to the sun. You should see your hand through it. (And yes, it really is made with bones!) Crystal has lead in it, so it will feel extra heavy. And if you ping crystal with your fingertip, it will make a ringing sound and not a thud. 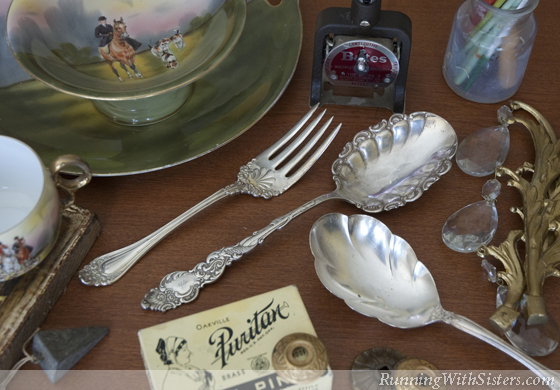 When checking out silver, look for the most obvious hallmarks. The word “sterling” or the numbers “925” mean 92.5% silver, a.k.a. sterling silver. A picture of a lion with a raised foot also indicates a piece is sterling silver all the way through. The letters EP or EPNS tell you right away something is electroplated. In other words, just silver-plated on the outside. It’s a lot less expensive, but it can be just as elegant!